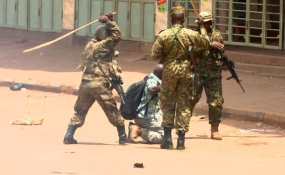 Ugandan soldiers beating up Reuters photojournalist James Akena as he covered the protests over the detention of several Opposition MPs in Kampala. Two journalists, Yolande Kusaya and Cédrick Kidimbu, with the privately owned Radio Lisanga Télévision (RLTV) were arrested in Nsele municipality of Kinshasa, the capital of the Democratic Republic of the Congo, on July 17, 2018, and detained for four days at the prosecutor's office in Kinkole, a suburb northeast of the city, according to the journalists and a report by local press freedom group Journaliste En Danger. The two journalists were released unconditionally on July 20, 2018, and no charges were filed, according to RLTV director Kaly Kalonda. Kusaya and Kidimbu told CPJ that they had traveled to Nsele to verify a report by a resident who said the mayor of Kinkole municipality, Augustine Nkama Indi, threatened to kill him and that his house was subsequently burned. "We were just trying to find out wherever this information was correct and if the mayor was involved in any way," Kalonda told CPJ. Their story on the incident was never broadcast. The two journalists called to get an appointment with Indi, arrived at the mayor's office, and were then arrested, Kalonda told CPJ. The reason given by the prosecutor for their arrest was that the document stating the aims and the length of their trip--which Kalonda provided as justification for their journalistic investigation--had an error on the date (August 13 instead of July 13), and because they were not carrying their press cards, Kalonda said. "Congolese citizens and journalists have the right to ask authorities questions of public interests without showing any documents," Aimé Bucko Muhimuzi, a lawyer experienced in DRC's legislation pertaining to the media, told CPJ. Indi told CPJ over the phone that they did not order the arrest of the two journalists and CPJ's repeated calls to the prosecutor in Kinkole went unanswered. When contacted by CPJ over the phone, an officer at the police station in Kinkole said they could not comment because they do not talk to people working with foreign organizations.